"Feel the adventure, Embrace the discovery"
The Greenway is 46km long from Dungarvan to Waterford, taking approximately 5 hours (leisurely cycle) to include stopping off halfway for lunch in Kilmacthomas Village or the Coach House Coffee, Union Workhouse which is 2 hours from Dungarvan Town and 2 hours from Waterford City. After 10km from Dungarvan, (halfway to Kilmacthomas) you have O’Mahoney’s Pub, Durrow which is just after Ballyvoyle Tunnell (Coffee/Toilet Facilities) and 10km from Waterford, (halfway to Kilmacthomas), you have Mount Congreve House & Gardens, also Kilmeaden Waterford & Suir Valley Railway, (Coffee/Toilet Facilities). During the Summer months, there will be various pop-up-shops along the route. OUR DEPOTS: Open every day from 9am to 6pm, Sexton Street, Abbeyside, Dungarvan , (just beyond the traffic lights with the beginning of the Greenway literally just around the corner), Kilmacthomas, The Union Workhouse adjacent to the Coach House Coffee, which is directly onto the Greenway and Hanover Street in Waterford, opposite the Bus Station on the Quay and just above Dooleys Hotel. For Winter months, we are open, however, please contact us for the opening hours and bus times etc. 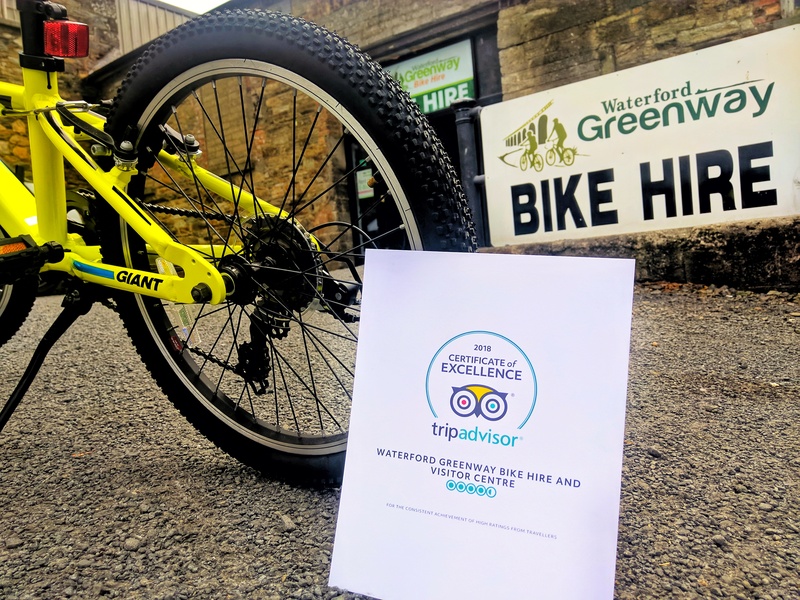 BOOKING REQUIREMENTS: Booking in advance is advisable, via online, waterfordgreenwaybikehire.com or our central booking line, 051 295955, we need to know your pick-up location, what bikes you require, ladies/ gents/ kids/attachments, i.e trailers, seats, tow alongs or an electric bike. PARKING: Waterford, there is parking on the Quay, Kilmacthomas, The Union Workhouse, free Carpark adjacent to the Greenway & Coach House Coffee and Dungarvan, Free Carpark behind Eurospar in Abbeyside or numerous other Carparks within the Town. FREE SHUTTLE BUS: The Shuttle Bus can only be used for Customers that hire bikes from ourselves. You can only book the Shuttle Bus once you drop off your bike, you cannot pre-book same. You can decide during your cycle where to drop off your bikes. We now operate 5 Shuttle Buses which will leave every hour from each Depot. PRICES: Our prices include the following: Bikes, Shuttle Bus, Helmets, Locks, Bungee Cords if required. Our Bikes are all Giant Hybrids, the standard adult bike is €25, Electric bikes are €45, Kids Bikes, €10 to include 20 inch bike which would be suitable for 6 to 8 year olds and, 24 inch Bike which would be suitable for 9 to 12 year olds. Tow Along Bikes (Free), suitable for 4 to 6 years olds that have only began cycling and wouldn’t be able to cycle too far (they would have to be able to balance). Trailers (Free) suitable from new born up to 4 years and Seats (Free) are suitable up 3 years. 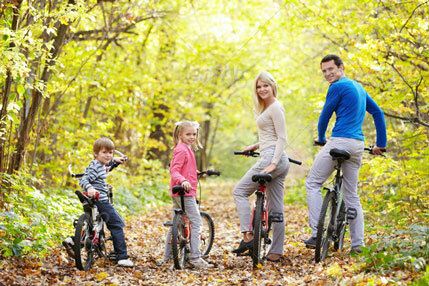 BOOK: Via our website, waterfordgreenwaybikehire.com or phone central booking, 051 295955.